It takes a lot to differentiate your business today. The key is not just knowing what choices your customers make, but being able to understand why they make those choices, how they feel about them, and what their experiences with your organization are like. Only with an accurate understanding of that can you deliver a unique customer experience and make good predictions about customer behavior. A solid, connected business strategy driven by marketing analytics is the way to accomplish that goal. 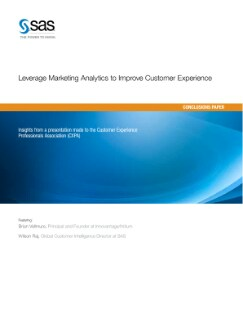 This report describes how marketing analytics can help unlock the full strategic value of your data and influence business processes to deliver just the right customer experience – one that will set your business apart from all the rest.